Depending on your storage requirements, sometimes a four bay NAS might not offer the storage capacity that you need - even if you fully populate it with 6TB drives. Or, you may want to configure your NAS for RAID 10, but would like to have a global hot spare. For either of these scenarios, Thecus' N5810PRO could be the right solution. The N5810PRO is a five bay NAS that features five Gigabit Ethernet ports for link aggregation, fail over and multiple network connection. In addition, it has a built-in "mini" UPS powered by an optional ($50 MSRP) 14.4 V 2000mAh hour battery. The UPS won't supply power for very long, but long enough for a power outage up to a few minutes long. Before it runs out of juice, the UPS will safely shut down your NAS. Like most NASes with more than four bays, the N5810PRO is targeted to the SMB market rather than the SoHo/Home market. Still, it has an HDMI port for Video/Audio out and includes DLNA and iTunes servers. In this review, we will be comparing the N5810PRO to the ASUSTOR AS5104 and QNAP TS-453 Pro four-bay NASes. All three NASes are based on an Intel quad-core J1900 Celeron. The image below shows the front (left) and rear (right) panel callouts. On the front panel, there are Power (top), System status, LAN link/activity for WAN/LAN1 and LAN2 and USB file copy status LEDs. Below the status indicators is a USB copy button and the power switch. There's only a single USB 3.0 port on the front panel - probably a convenience feature for USB file copies. Menu navigation buttons are found below the LCD display panel. The disk trays have locks for added security and status LEDs. On the rear panel, you'll find two USB 3.0 ports, two USB 2.0 ports, five Gigabit Ethernet ports, HDMI port and an analog audio port. The fan, power connector and UPS battery slot round out the rear panel. The image below shows the main board for the N5810PRO. The Intel J1900 processor is located under the large heat sink. On the left are connectors for the rear panel along with a PCB-mounted connector for the drive backplane. The memory slot is populated with a 4 GB DDR3 SoDIMM. There's a second slot open for expansion that can bring total memory up to 8 GB. Click here for a list of compatible memory. 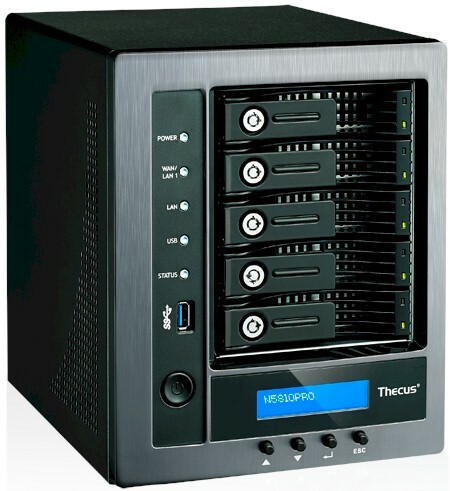 The Thecus ships with 4 GB of RAM. The other two ship with only 2 GB of RAM. All are upgradeable to 8 GB. The ASUSTOR NAS only has two Gigabit Ethernet ports. The QNAP has four and the Thecus has five. The N5810PRO runs on Thecus OS5. Thecus explained the older OS5 is targeted at SMB products and OS6, which I reviewed when it was first released, at Home/SoHo. But the feature sets and GUI look and feel are very similar in both OSes. The gallery below shows some screenshots from the N5810PRO. Several of them highlight some of the unique features of the N5810PRO, such as configuration of the 5 LAN ports and an image from the log file showing the NAS switching to UPS power before shutting down gracefully. You'll note missing "radio button" labels in some of the screenshots, which were taken with FireFox 38.0.5 Windows. Thecus confirmed the bug, which will be fixed via firmware update. In the meantime, we found Internet Explorer properly shows the labels. As noted in the introduction, the N5810PRO has a built-in "mini" UPS. In our "pull the plug" test, the NAS started to beep and the front panel displayed the power loss. Within a couple of minutes, a different, lower toned beep drew our attention to the front panel that indicated shutdown had started. The system then shut down gracefully. Configure or view configuration for any of the 5 available LANs. Create an iSCSI Target Volume or Create LUN. Missing button labels is a bug. System Log shows AC power loss, switch to battery and then system shutdown due to loss of power. RAID Volume Creation. Missing button labels is a bug.